Marrakech is the kind of city that inspires feeling – from the religious places of worship, to the aromatic spice souks, to the perfect sunsets that loom over Jemaa el Fnaa square. As a busy financial, cultural and religious hub steeped in history and tradition, a few days here will open you up to an exciting culture. Nicknamed the Red City due to the city walls and red sandstone buildings, Marrakech is both vibrant and enchanting. Surrounded by the Atlas Mountains and desert sands, there’s plenty to see and do outside of this North African city. 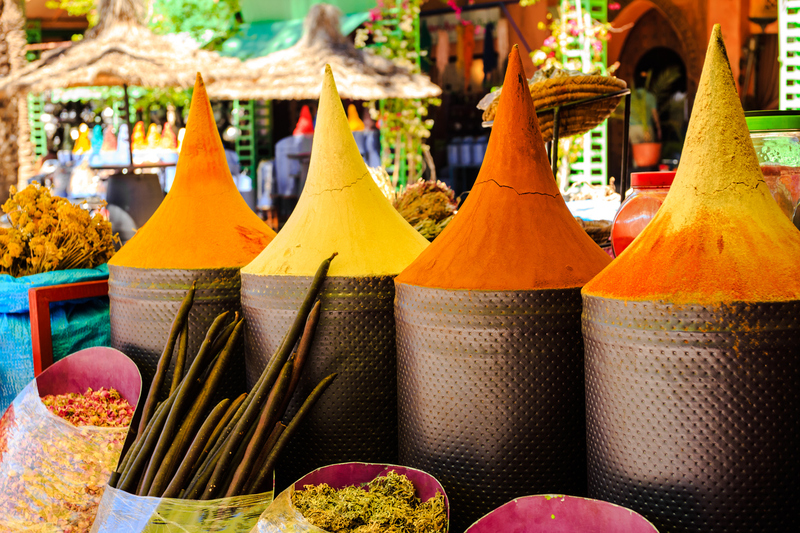 Marrakech offers an abundance of things to see and do. Sightseeing in the city will lead you to a few common places which include: the 16th century Saadian Tombs, Jardin Majorelle (YSL Gardens) restored by Yves Saint Laurent and Pierre Bergé, and the opulent Bahia Palace. 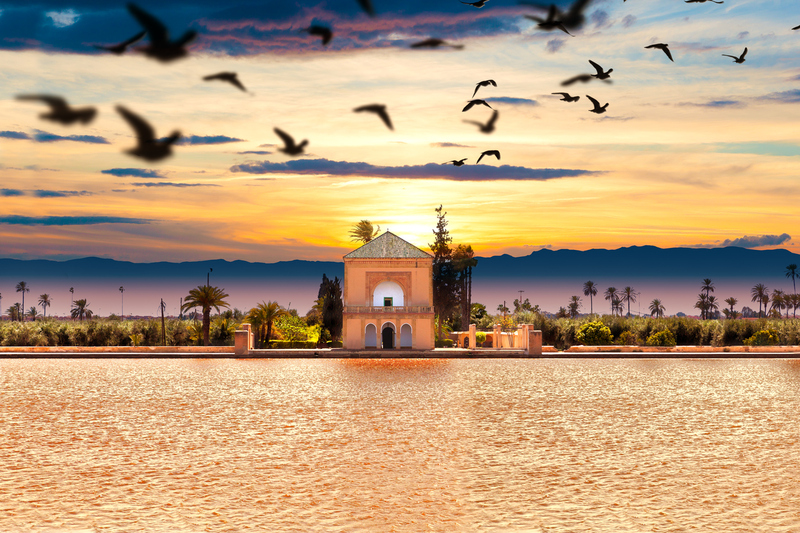 Elsewhere in Marrakech, you can admire the Menara Gardens which date back to the 12th century or visit important places of worship; Koutoubia Minaret and Ben Youssef Mosque. Art lovers may wish to explore Dar Si Said Museum and the Museum of Islamic Art, while history buffs will find Marrakech Museum insightful. Surprisingly, Marrakech has a hidden street art scene and trendy cultural quarter, Gueliz which was built during the French colonial era. Explore the winding alleys and narrow streets within the old Medina which surround Jemaa el Fnaa square. Marrakech is famous for its souks and they are named according to what product is sold there. A great tip is to avoid the afternoon heat and visit in the mornings or evenings. The main and biggest souk is Souk Semmarine; it sells rugs, pottery, jewellery and trinkets. Souk Place des épices is home to pyramids of fragrant spices piled high, and Souk Smata features brightly coloured and sequined shoes. There are so many to choose from, and you will undoubtedly come away with treasured goods. In Jemaa el Fnaa square, locals and tourists flock here for street food, live music and street entertainment. It remains one of the busiest places in Marrakech, especially in the evenings. With everything from snake charmers to henna tattoo artists, an evening spent here is full of surprises! There are rooftop bars and café’s locally, so you can seek respite from the crowds – and take in the atmosphere. 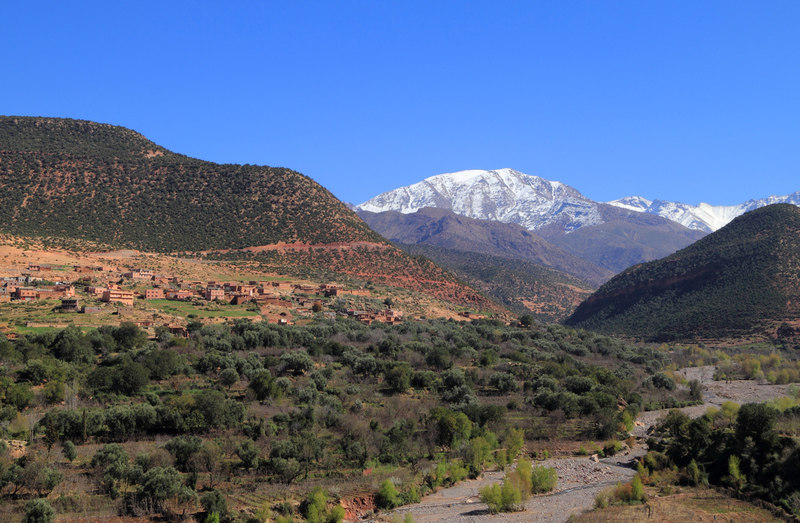 Take to the High Atlas Mountains and explore Toubkal National Park, which is about 70km from Marrakech city. Its home to the highest mountain in North Africa: Jebel Toubkal. There are guided hikes and tours of the mountains that offer incredible views, and allow tourists to see another side of Morocco. Other day trips include Agafay Desert, Ouzoud Waterfalls just two hours away, and the Ourika Valley.